Being a muso with an array of muso friends, I often think about social media for musicians. Social media is a vital medium to connect with fans, fellow musos, friends and family. Social media is here to stay and if you’re a musician, it is an essential tool in getting your music heard and name out there. It’s how you connect, converse and share with your audiences and lets face it, without them you’re just playing to your mum in your lounge room right? There are so many tools out there that are available for home recording, sharing and starting conversations, why not let the world know? 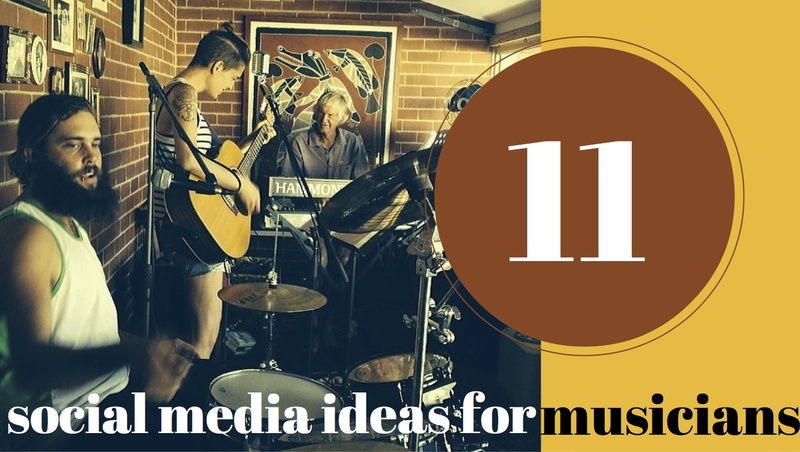 Here are 11 social media ideas for musicians, bands, duos and solo performers! You need a Facebook page for your band. Get one now. It’s a great place to start! Add a mailing list tab to your Facebook page and link it to Mailchimp. Once you have a bunch of fans it’s also a good place to advertise your gigs and link to your website. Join Facebook groups and like pages (as your band) in your genre and in your area. Network, chat, jam, share and support other bands. What goes around comes around yes? Can’t find an appropriate group? Start one! Enewsletters are a great way to keep your fans up-to-date with your upcoming shows, albums and recordings. Especially the dedicated ones. Mailchimp is super easy to use. Its all step-by-step and free! As a working band, you should have something being posted on your social media platforms at least once a day. Install a scheduler or use the Facebook one. Hootsuite or Buffer are also good options as well. Post things that are relevant. Be authentic. Show your audience more than just your songs. Tell them your story. A band that is relatable gets loyal, fans for life. Once you’ve got your logo and branding for your band (here’s why you need a kick-arse logo), you can use it across other forms of social media such as Twitter. Set it up to be consistent. Make sure you include all the relative information. Your contact details, your website or Facebook links etc. Then begin to follow other bands and people on Twitter who are of a similar ilk to yourself. Tweet, tweet, tweet! Learn some twitter etiquette, it can go a long way. Take before, during, after photos of rehearsals, gigs, writing songs and use those photos and information as a part of your story. Don’t be afraid to get vulnerable! Connect and network with other bands and performers. Hash tag the hell out it. Get creative. Whilst you are able to see Instagram online on your computer, it’s only accessible to POST from your phone. You can then however link Instagram to your other social media platforms (twitter, Facebook) to share posts. Another picture based social media stream. Available on your phone, tablet or laptop. Snap happy! Take video of yourselves. This helps when you’re trying to get gigs. It will help those who are going to employ your services to decide if you’re what they want. Show behind the scenes footage and don’t be afraid to be yourself. Record some stuff…use your phone or garage band if you have to…and UPLOAD IT. Soundcloud is like Facebook for music. Engage, listen to others, like, comment, swap, download. Ever heard of getting your fans to fund your next project? Amanda Palmer famously started the kickstarter campaign to pay for her recording Why not you? Recording and producing music can get exy. Imagine if all of your Facebook friends donated $5 to your cause? Kickstarter, Crowdfunding for Musicians and Pozible are a few examples.